Extracted from The Road to Emmaus: A History of the Blessed Sacrament Congregation in Australia by Damien Cash (Melbourne: Congregation of the Blessed Sacrament in Australia in association with David Lovell Publishing, 2007). Reprinted with permission. Eymard had no outward signs to prove God’s will, no miracles and no visions, as he explained, but he knew in his heart that God wanted him to follow the course he had discerned. As he begged to be freed from his vows, he told Favre he would leave regardless, if necessary seeking dispensation from other church authorities. Favre wisely recognized he had now played his last card and agreed to release Eymard. Both men had believed they were doing God’s will. On 30 April 1856, Eymard took the Paris train from Lyon. He had two hundred francs. And a vision of life dedicated to the eucharist. Despite Eymard’s sickness and personal limitations—the ‘incompetence’ he bluntly admitted—he simply understood and accepted that he had been chosen to undertake God’s eucharistic service. The strength of this faith was tested on his arrival in Paris, when some of his former Marist colleagues accused him of pride and ambition. As part of the release arrangement, Eymard had agreed to submit his ideals to an independent investigation led by the archbishop of Paris Marie-Dominique Sibour. After a twelve-day hearing in May 1856, Sibour together with his cousin (the Paris auxiliary bishop Léon Sibour) and the bishop of Carcassonne (Francois-Alexandre Roullet de la Bouillerie) told Eymard that there was no doubt that the will of God was manifest in the eucharist and he should stop hesitating and dedicate himself to the undertaking. The bishops’ acceptance was not simply based on Eymard’s eucharistic adoration proposals. His preparedness to work for the first communion of adults was also important. For Eymard’s followers to express their faith through adoration was not enough. They had to share it, too. That was the lesson of Paris. Early concepts of the ‘Order of the Blessed Sacrament’ had turned on ‘perpetual and reparatory adoration’ with a secondary emphasis on a more ‘active’ apostolate such as preparing first communicants and preaching. At Paris, this catechetical role was placed among the essential priorities. Eymard’s eucharistic adorers were also eucharistic missionaries. His submission to the bishops in May 1856 distinguished between the Society’s ‘purpose’ and its ‘works’. The works, such as preaching, offering retreats, and preparing first communicants were related to the purpose of ‘worship and service of the adorable Eucharist’ and to associated purposes such as working for the salvation of souls and stimulating devotion to the Blessed Sacrament. Worship, in the form of ‘perpetual and reparatory adoration’, was not a work, but part of the essential purpose of the Society. This fine distinction would not always be appreciated by Eymard’s followers. In May 1856, Eymard outlined an organization which ‘unites the active and contemplative life’. It was on this basis that he advised the pope of the foundation of the ‘Society of the Blessed Sacrament’ and he later dated its establishment from the bishops’ consent in Paris on 13 May 1856. By September 1856 they had finished building their chapel or ‘cenacle’ as Eymard named it, after the Latin word for the upstairs room in the house in Jerusalem where Christ and his apostles were believed to have shared the Last Supper. Money was beginning to arrive after Eymard had travelled through rural France seeking donations. Two priests joined the community before the end of 1856. On 6 January 1857 they established public exposition of the Blessed Sacrament, which was then maintained for three days each week. A ‘few devout faithful come’, Eymard wrote, and a few interested candidates came, and went. As 1857 progressed, Eymard was left with little more than hope. The archdiocese of Paris wanted the property for other purposes. The first novice did not stay. Eymard became ill and left the community for five weeks. On his return, the two new priests had gone. When money ran low, Eymard and de Cuers began selling their books. There was a disagreement with the archbishop. Then de Cuers walked out, leaving Eymard in what he described as ‘the greatest darkness’ before de Cuers returned next day, ready to start again. Those involved are children workers, vagabonds, or those placed in apprenticeship early and who have let the age of instruction for First Communion slip by . . . there are thousands of them in Paris. Rag pickers, rope and match makers constituted the recruits from the workers’ ranks, the rest were drawn from the ranks of the idlers, the indigent and beggars. It is noticeable that in these early days, Eymard welcomed the assistance of the laity. The lack of numbers in the Congregation meant he had to draw on his friends and on those who volunteered their services, in particular Louis Perret (an old friend from Lyon), the members of the St Vincent de Paul Society, and also some of his female friends who could better relate to women and girls from the factories. If Eymard had sat back and waited for priestly vocations, ‘God’s work’ might not have been done. Baptism, communion and confirmation were the first spiritual fruits of Eymard’s ministry. Material benefits also resulted. Perrett and other donors sponsored communion groups under Eymard’s training. The experience became an upward step for these poor children, signified by the new set of clothes every child received for his or her First Communion. According to Norman Pelletier, by the end of 1858 ‘over a hundred children and adults had made their first communion’ as a result of the Congregation’s teaching. Ragpickers were the lowest of the poor in Paris. To ‘raise up what is most wretched and depraved’ is a ‘beautiful’ mission, Eymard declared, and he was careful to ensure this process did not simply end at first communion. He attempted to maintain links by starting a workers’ club and organising regular retreats. Invariably, he supplied food and drink to those who participated (no doubt an incentive for some) and clothing where necessary. Eymard became the beggar himself as he preached and pleaded for funds in the richer parishes of Paris. By April 1858 the community at 68 rue du Faubourg Saint-Jacques had grown to eight men (four priests and four brothers). They were twelve by the end of the year, not a lot for all the work Eymard planned, but as many as Christ ever had. Faced with an overwhelming need and limited resources, Eymard did not think only of men. He contacted Marguerite Guillot, who was now director of the Third Order of Mary. Eymard had acted as Guillot’s spiritual adviser for many years. He had also guided a Ladies’ Adoration Society based in Toulon. Both groups expressed interest in linking with Eymard’s work, and at his suggestion, they agreed to combine as a community under the direction of Guillot. Eymard provided them with a house next door to the chapel (at 66 rue du Faubourg Sainte-Jacques) and began writing their spiritual rule of life. The women initially shared the chapel with the men and specialized in catechesis of women and young girls. Although the Toulon group did not stay, Guillot and a few others persevered. Eymard wanted them to be independent. Under his general supervision and Guillot’s inspirational leadership, they were eventually established as a separate, papally-approved religious congregation known as the Servants of the Blessed Sacrament. 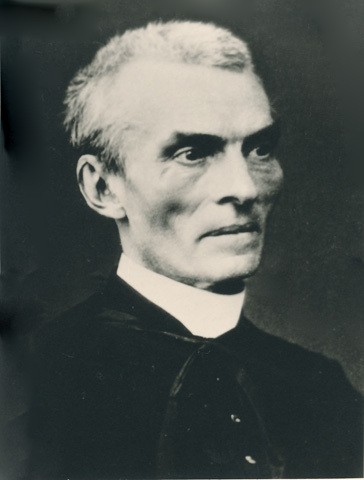 Eymard first sought papal approval for his own Congregation in December 1858. As a first step in this process, he was granted a ‘writ of praise’ by Pope Pius IX in January 1859. Full approbation required the establishment of three or more communities. On 2 March 1859 he knelt before the exposed Blessed Sacrament and, according to a formula he had personally composed, offered himself ‘to the perpetual service of Our Lord in the Blessed Eucharist’. His fellow priests Raymond de Cuers and Armand Champion also made a similar ‘profession’ or declaration of vows. De Cuers left almost immediately for Marseille to lay the foundations of a second community that was established under his leadership on 9 November 1859. The diocese of Marseille was headed by Eymard’s old friend Eugène de Mazenod (now a bishop). Under de Mazenod, Marseilles was fertile ground for eucharistic activities. De Mazenod welcomed the inauguration of the first ‘Association of the Most Blessed Sacrament’ in November 1859, in which the laity enrolled with religious in a fraternal society of adorers committed to regular worship of the eucharist. Within a few months the Association had six hundred members. Enrolments reached three thousand by late 1861 and the movement later spread throughout France and overseas. We don’t receive any Mass stipends in Paris, just one or two a week. Poor people don’t have anything to give for them: and these are the people we know. Like Eymard, de Cuers emphasized that ‘the kingship of Jesus Christ should be glorified by Eucharistic worship’. Reverence was taken to extreme lengths. When the Blessed Sacrament was exposed, de Cuers would only walk out of Church backwards. The character of Marseilles under de Cuers influenced the later history of the Congregation. As Pelletier explains, when de Cuers eventually succeeded Eymard as superior-general and the Paris community moved to the other side of the Seine river, Eymard’s ‘fervour for the poor’ and his first communion work were left behind as the Marseilles community became the basic model for the Congregation. After a third community was started at Angers in December 1862, Eymard went to Rome seeking papal approval for the Congregation. Pope Pius IX gave Eymard two audiences in March and April 1863, and on 8 May he granted a Decree of Approbation which became effective on 3 June 1863. The decree gave the Congregation ‘pontifical right’ which automatically strengthened its standing and potential to expand. Before that time, the Congregation only enjoyed ‘diocesan right’, which was a more limited form of authority, restricting its operations to those localities where the approval of individual bishops had been obtained. The Congregation comprised twenty-eight members in March 1863. Nine of these were priests. The rest were deacons, students and aspirants of various kinds. Among those who had come and gone was the young sculptor Auguste Rodin (1840–1917), who had lived as ‘Brother Augustin’ in the community at Faubourg Saint-Jacques. Rodin joined the Congregation around Christmas 1862, three weeks after the premature death of his sister Maria who had been a novice in a convent. Grief stricken and almost suicidal, Rodin had not entered the community with a clear awareness of his calling. Eymard encouraged him to continue his art, using a garden shed as a studio. He even agreed to sit as a subject, although the magnificent bust Rodin produced of Eymard was not entirely to the sitter’s liking. Eymard complained about ‘devil’s horns’ in his exaggerated hairstyle! As a true artist, Rodin refused to compromise. Rodin had clearly seen a more powerful and determined personality than the gentle and fragile image that might be suggested by some of the photographs which have survived today. The great sculptor remained in the Congregation for five months before returning to pursue his real vocation in secular life. Contrary to some reports, Rodin later maintained close links with the Congregation. Soon after the pontifical decree, de Cuers fell out with Eymard. Pelletier hints at a personality clash. Where Eymard was open and flexible, often uncertain and inclined to feel his way through prayer and experience, de Cuers had a naval background which emphasized order and discipline. These values may have contributed to certain ‘narrow and simplistic’ attitudes on the part of de Cuers. The men’s differences flared when Eymard was drafting the Constitutions in 1863. An important issue was whether or not lay brothers should be included in the Congregation. Eymard wanted both priests and brothers. De Cuers wanted only priests, like himself. To render above all and by all its members, a solemn and perpetual cult [practice] of adoration to Our Lord Jesus Christ, dwelling perpetually in the Most Blessed Sacrament of the altar for the love of men.
. . . To obtain this double purpose more effectively, they will make the three perpetual vows of poverty, chastity and obedience and live according to the common life. Other rules described the service of adoration and exposition, how to pray and observe silence, and identified various ways to glorify the eucharist including the preparation of ‘poor adult workers for First Communion’.